The Benefits of Engaging Customers Through Email - Powered by technology, our unique program uses software and algorithms to conduct a custom online competitive edge! In the age of instant gratification and ever-shortening attention spans, it can be a challenge to capture someone's attention. Marketing professionals battle against that apathy every day. They spend entire careers finding the perfect way to capture a customer's interest. Facebook advertising and Google ad words are some of the modern marketer's favourite tools. But people underestimate the benefits of email marketing. It's an oldie but goodie in the marketing world. 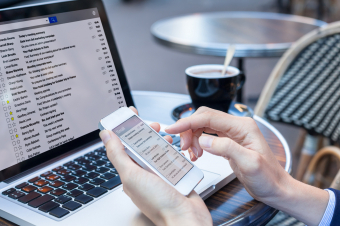 Email may be one of the older forms of electronic communication, but it's still vital to the work and personal lives of anyone with a wifi connection. A well-crafted marketing email can turn a vaguely interested person into an active consumer of your product. Here are some reasons not to underestimate the importance of email marketing. People prefer promotional emails in their inboxes to disruptive text messages or Facebook ads that clutter their feeds. An email can wait until the customer has time to view the material. And since most people check their email on the go these days, flexible timing is important. Many customers feel they build a rapport with the company through regular marketing communications, especially those personalized to the recipient. Customers who feel they can trust a company will do increased, regular business with that company. Marketing platforms like MailChimp and Hubspot make conversion and engagement metrics a breeze to track. You can build the email in the program, send it to your customer base, and view in real time every individual's reaction to that email marketing campaign. With a little planning, email marketing can also help you keep track of your customers well after they've closed that message. Many marketing platforms will keep a record of when customers who've opened marketing emails forward that email to a friend or visit your website. Social media sites like Facebook, Google, and LinkedIn have their own rules and regulations for marketing interactions. Those rules aren't simple, and learning how to operate under someone else's supervision can take hours of training. And since these social media outlets exist under the umbrella of corporations, marketers have to pay for ad space. Email is an open platform. No one owns it, and no one runs it. You don't have to follow any rules to market to your clients, and there's no pay barrier to send your message out to the world. Social media and technological advances may give marketers ever more opportunities for communication, but email is still the king. After all, what would people do if they couldn't check their inboxes at a long stoplight or in the middle of a boring staff meeting? If you're ready to elevate your business with improved marketing practices, but you don't quite know where to start, ask us about digital marketing strategies. We'd be happy to help you kickstart your next marketing campaign.